Rail King maintenance and repair | TN, AR, MS, MO – We customize! Need more? You have options. Shelby Railroad Service, Inc. has qualified factory trained technicians that are not only skilled in Rail King maintenance, they can also repair / recondition your rail car mover regardless of the brand. We know the railroad industry and know how to properly service your equipment. We’re more than just your authorized Rail King dealer. We have many other options, too! Just give us a call to find out what we can do for you! We will be happy to help you with all your Rail King maintenance. Some of the products we offer are Rail King Rail Car Movers, Trackmobile and Shuttlewagon. 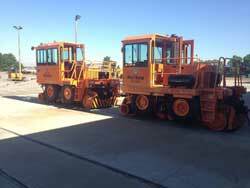 Our services include Rail King Rental, Renovated Rail King Trackmobiles, Trackmobile maintenance, rental and service. Our territory covers north of Jackson Mississippi, all of Arkansas, and West Tennessee. Call today! Copyright • Shelby Railroad Service, Inc. All rights reserved. Designed by LunaWeb - web designers in Memphis.